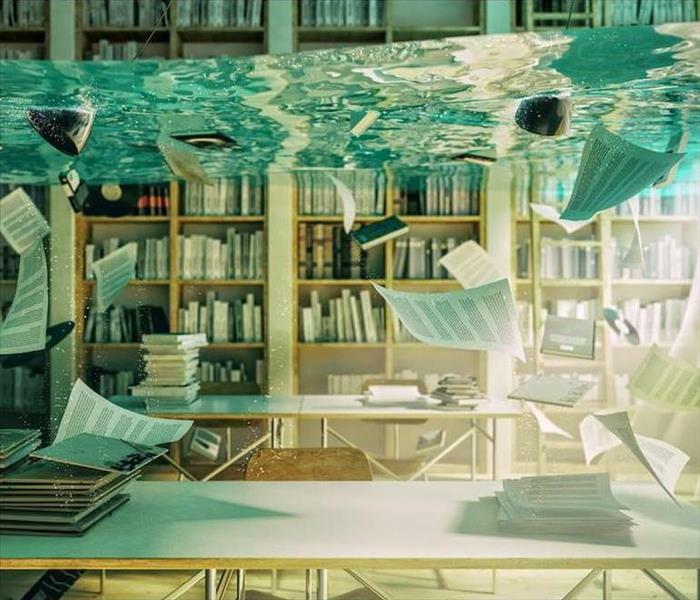 When flood damage affects your office, it is time to contact SERVPRO for water removal & remediation services. We are available 24/7 365 days a year. Being just a bit inland from Lake Ontario puts Watertown at greater risk for flooding than many other cities and towns in our state. Rain and snow storms can come rolling in with little warning, and local businesses can find themselves with closed doors and no production until the owner removes the water and its effects. Commercial flood damage to Watertown business requires not just water removal, but quick drying of the structure and contents as well. SERVPRO response teams know that even a small amount of moisture can ruin inventory in a light industrial building, such as an electronics assembly plant. Even after removing the flood water, a high level of moisture remains in the structure. The increased air moisture content (high humidity) can cause the same damage as floodwaters getting into something, just at a slower rate. That is why our technicians immediately install dehumidifiers after finishing up with the pumps and other water extraction devices. Since drying components by hand is a risky method at best, SERVPRO specialists use these devices to pull water from the surrounding air. The action speeds up the natural evaporation process and dries the electronics without needing to touch them. To increase the evaporation rate, team members can also place exhaust fans to pull the damp air from inside the facility. They can further reduce the drying time by using air movers. Specialists adjust the speed and temperature of the airflow to help quickly force water off of delicate surfaces without causing secondary damage to the components. The action pushes it into the air where it is captured and removed by either the dehumidifiers or exhaust fans. At SERVPRO of Jefferson County, our goal is to help every business reopen its doors. We understand that your customers have a choice when it comes to suppliers, and missing even one day’s worth of production can result in losing a valuable sale. If your business is in this situation, or you want to prepare now for the next storm, call us at (315) 777-8377 today to schedule a service call. We are here for you. Click here for more information about the city of Watertown. From snowmelt to rain, flooding is a year-round worry for Watertown residents. In the restoration industry, they are different approaches to flooding informed by the type of water that enters the property. The sliding scale of contamination in water runs from clean water to grey water, to black water. Blackwater emergencies contain levels of contamination that could include animal carcasses, raw sewage or other pathogens. Typically a black water emergency is caused by backed up sewer points or road overflow. After heavy rainfall, the likelihood of requiring professional assistance to deal with flood damage in Watertown dramatically increases. SERVPRO offers highly trained technicians with the correct licenses and qualifications to restore your home to its preloss condition. We equip our technicians with the correct PPE equipment as well as critical water extraction units to help remove, dry and restore the property. All types of flooding emergency require a thorough assessment of the type of water in the property. Microbes that reside in moisture, as well as the home, can cause the impact of flooding to become increasingly severe. Failure to remove clean water promptly can cause it to become grey or black water. The primary means of removing standing water is through vacuuming, heating, and pumping. We tackle standing water above two inches by placing submersible gas powered pumps into the affected zone. These pumps shift gallons of water along a hose to an open sewer point and are the fastest method. However, once standing water levels drop below two inches extraction units are a requirement to remove the remaining moisture. Clearing away large quantities can be done quickly; however, fabrics, carpets or furnishings become water-logged. SERVPRO technicians are experts at drawing moisture from porous surfaces. Since moisture moves from wet to dry, we can remove water from hard flooring and soft furnishing by controlling the humidity. Using desiccant dehumidifiers, our technicians can lower humidity below 40PGG which raises moisture from saturated surfaces. Drying your home after a flood needs to be done in a time efficient manner to limit losses, contact SERVPRO of Jefferson County at (315) 777-8377 to arrange service. Read about Thompson Park here. If your home has been affected by an ice dam and has resulting water damage, call our SERVPRO team for water removal as well as minor roof fixes. With the winter seasons that Watertown residents become accustomed to experiencing, many provisions get made to protect homes against the potential hazards winter weather presents. While snowfall becomes heavy and can put a great strain on roofs, this is not the most immediately threatening situation that occurs in this area of your house. Snow beginning to melt and freezing again along the eaves and edges of your roof create literal dams that prevent melting snow from escaping. Without an ability to move away, this dam continues to increase in size and tests the mettle of your roof as it holds higher volumes of water and ice than it gets built to withstand. 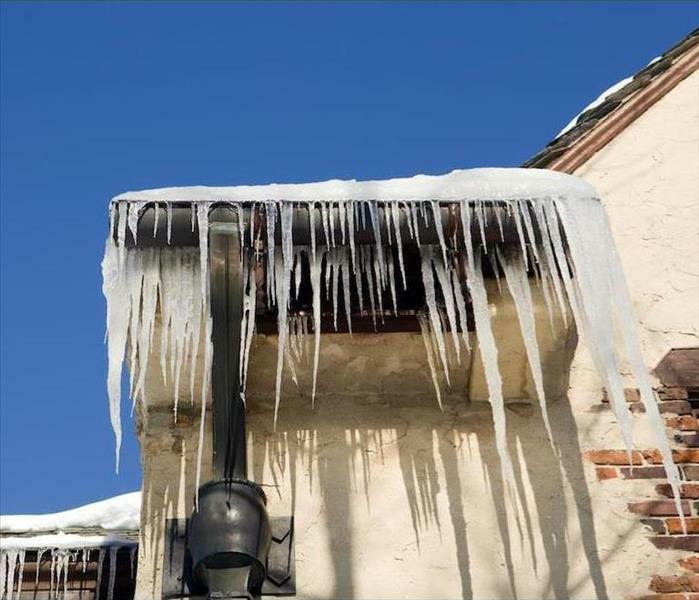 While you cannot predict or plan for the possibility of the damage that this can do to your home, ice dams often lead to penetration of the shingles and backing and require professional water removal in Watertown. Our SERVPRO professionals can help to understand the full extent of this damage and possible flooding scenario and arrive with the equipment and personnel that can help quickly. With flooding and excess water in areas like your attic or coming through the ceiling, getting professional assistance immediately can begin mitigation work to protect your home and its occupants from considerable loss. Our certified professionals have effective mitigation tactics that can seal up penetration points in the roof temporarily until reconstruction and repair can begin. Our SERVPRO technicians inside can work to remove the water effectively with high-powered gas pumps and portable electric sump pump extractors. Removing the pooling water helps to reduce penetration into construction materials and structural elements, and can also reduce the need for excessive demolition and reconstruction. While you cannot account for when ice damming would occur on your roof, our SERVPRO of Jefferson County rapid response team can help you remove the water and clean up the mess whenever it happens. Our experienced professionals are available 24/7 by calling (315) 777-8377. While you might not have events that take place in your Fort Drum theater every day, the facility needs to be kept in top form when possible. The historic building has survived many harsh weather systems and storm damages that have occurred over the years, and it provides a place where art-minded residents can convene to appreciate theater productions. Whenever torrential rainfall occurs over many days, flooding can occur that can pour quickly through areas like the lobby and make their way down the natural grade to the stage area. 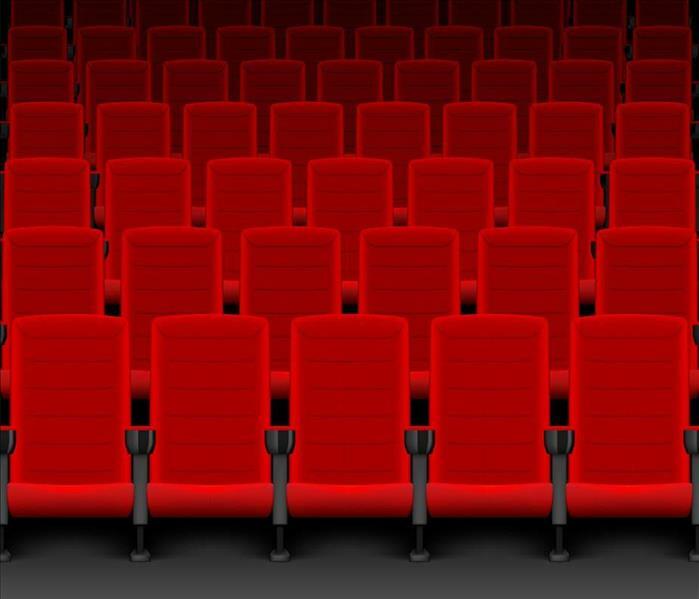 When disasters like these cause flood damage in your Fort Drum theater, you need a fast-acting team with the equipment to make a difference quickly. With the right response to the emergency, our professionals can often limit the spread of this damaging water throughout the building, reducing the affected area and helping to make later restoration efforts efficient and more cost-effective. Part of the effective approach that our SERVPRO team has for flood water removal and drying efforts relies on our advanced technology and equipment. Extraction is a vital component to protecting original materials from getting saturated by floodwaters spreading, and we have many tools that can work to contain the damage and prepare the theater for the drying efforts to come. Often portable sump pumps and gas-powered trash pumps are sufficient for removal. For excessive volumes of floodwater, we also roll out from our facility with an extractor truck for high-powered extraction of widely affected areas. It is important to remove this excess water as quickly as possible because saturation can occur quickly with many of the exposed materials. Drying tools like our high-velocity air movers and dehumidifiers can treat large areas contending with moisture. By removing the dampness lingering in the environment and affected materials, our SERVPRO professionals can limit the secondary effects like mold growth as well. One of the priorities that you have as a theater owner is getting the facility back open to those that need it and enjoy its productions. Seating padding and fabrics can be challenging to dry and sanitize. We have specialized hand wands that can generally restore these seats to preloss condition. To do this as efficiently and effectively as possible, you should trust in the fast response and expertise of our SERVPRO of Jefferson County water restoration specialists. Give us a call anytime at (315) 777-8377. For more about the local military base click here. Our SERVPRO of Jefferson County rapid response team is available 24/7 by calling (315) 777-8377. Whenever substantial water loss incidents affect your Adams home, you need assurance that the right professionals can respond quickly to get the excess water out. The faster that professionals like ours can reach your home, the better able our team is to protect other areas of your home that have not yet become exposed to the spreading floodwater. It is important to act quickly at the first sign of an emergency to secure these services and get vital mitigation work started. While many potential issues could arise once flood damage has begun in your Adams residence, the right response to the situation can help to prevent unexposed areas from getting drawn into the later demolition and reconstruction efforts that your home needs. With fast extraction and drying equipment that arrives with our responding SERVPRO team, we can work to limit the spread of floodwater through other areas of your property. Part of this ability comes from our rapid response to emergencies. 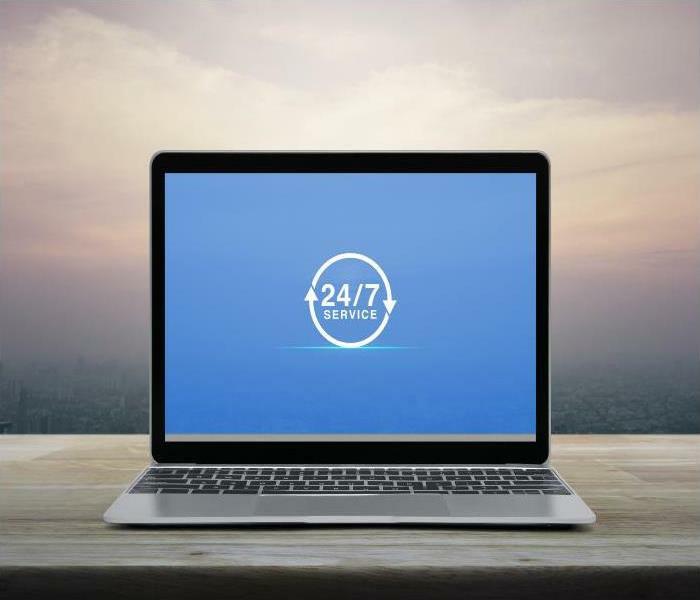 Our professionals remain available for all emergencies and disaster relief efforts 24/7, which is why we can say that We’re Faster to Any Size Disaster. From the time that our technicians arrive at your home, we can do a quick but thorough assessment of the current damage and begin setting up the necessary equipment for extraction efforts to start. We have many machines and tools that can help. From truck-mounted pumps on our production trucks that can pull 300 psi to specialized equipment like our extraction wands and weighted ROVER extraction for carpeted areas of your home, we can remove this hazard from your property promptly. 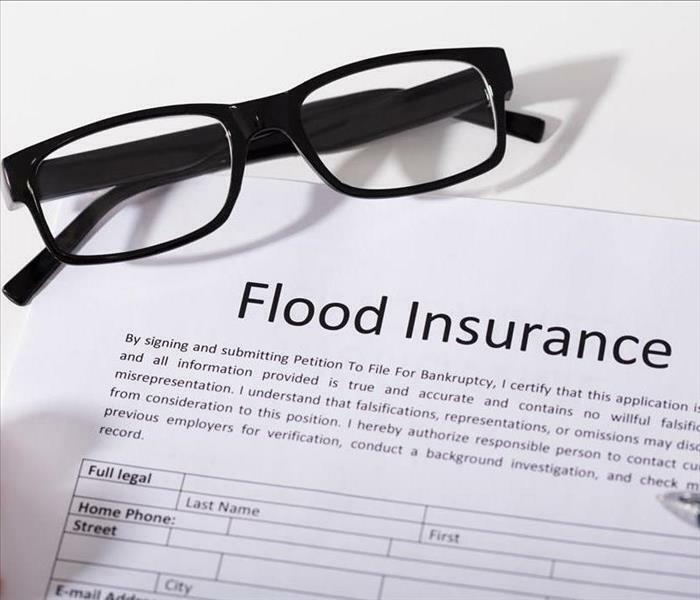 The best way that any homeowner can protect their property and limit the cost of restoration when facing a flood is to respond quickly to the situation. Our SERVPRO of Jefferson County rapid response team is available 24/7 by calling (315) 777-8377. Click here for more about Adams. When your shop is facing flooding and roof damage after a storm, contact SERVPRO for remediation efforts. Call right away for best results! Severe weather could take different forms to cause damage to your Watertown building housing your small shop. 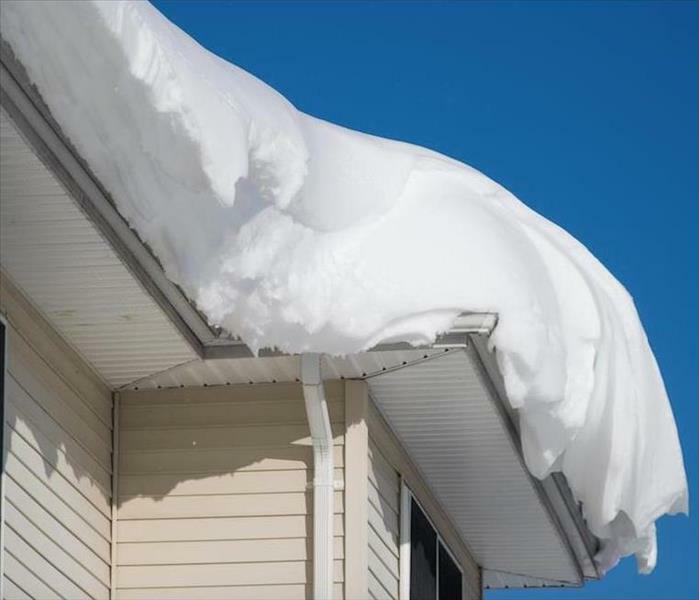 With heavy snowfall that does not melt off quickly, roofs can begin to weaken under the excessive weight and become vulnerable to water penetration. Once this occurs, water can flow through these penetration points unabated during torrential rainfall situations where steady runoff occurs. The result is flooding of your building that begins through the ceiling material and eventually works its way to the main floor of your shop over a brief period. While you might not know that your Watertown shop is at risk for flood damage until this situation is well underway, knowing what to do at the first sign of flood damage is critical to keeping your stock and your building safe from excessive ruin and later reconstruction. You need professionals that can respond quickly to the emergency to help slow the spread of the water and restore the damage fully, and our SERVPRO rapid response team can help. One of the first steps that our technicians must take when we arrive at your damaged building is to do what is necessary to stop the penetrating water from continuing to flow through the roof vulnerabilities. These points can often get sealed over with emergency board up and tarping services. This process can allow our team to get to work on extraction and drying efforts that can protect many of the saturated and exposed materials from tear out and replacement. Roof repair is something that must occur to restore your building fully following the extraction and drying of the exposed areas. Our licensed contractors can inspect the damage to the roof and determine the best course of action to repairing it or replacing it according to your wishes or that of your insurance provider. Roof damage can allow for flooding to occur quickly to your small shop under the right conditions. Our SERVPRO of Jefferson County rapid response team has the skilled contracting team and certified restoration specialists to help with every step of returning it to preloss conditions. Give us a call today at (315) 777-8377. Click here for more about Watertown. Flooding can affect the area and enter your home. Many times the floodwaters have unsafe debris and PPE must be utilized. Contact team SERVPRO. When an area in Watertown goes underwater, even for a short time, the environment changes. Microbes flourish, chemicals from roadways saturate the ground, and debris gets littered everywhere, tangled in landscaping and other outside structures. The area becomes a place of risk, and extra precautions need to be in place to protect anyone entering. Such dangers are why SERVPRO specialists wear special gear when mitigating homes that sustain flood damage in Watertown. Personal protective equipment or PPE keep our employees safe from the dangers of microbes and other possible harm. Microbes can cause many different health effects and debris can contain these and other dangers. Sharp glass, metal, and wood can puncture the skin, but our PPE drastically minimizes the possibility. Our PPE makes it possible for us to work in dirty environments, and efficiently clean everything up, so your family never needs to face these same dangers. The equipment we use to clean up your home, get it dry again, and then restore it are also practical and efficient. Flooding brings in water that quickly saturates everything, but a good percentage of this water quickly turns to water vapor and spreads. Your upper floors also require the use of desiccant machines. We run these during the majority of our work, so they quickly trap any moisture that travels upward. Pumping out any standing water happens much more rapidly than allowing the water to drain away naturally. Contacting us gets sandbags placed around your property's perimeter so pumping can commence. Tearing out ruined, waterlogged walls leaves the studs behind, and we test these to ensure they still meet minimum standards. Our PPE continues to protect us during this stage, as well, from nails and other sharp objects. Carpeting is notorious for its tacks, and it only takes one to cause a small but painful injury. Our gloves keep this from happening to us. To prevent similar incidents from happening after your family returns, we thoroughly vacuum all floors to remove such dangers. Paying attention to the details that matter most, SERVPRO of Jefferson County is always available to help make things “Like it never even happened” for you, safely, and efficiently. When you find your Carthage or Adams property mired in flood damage, call us at (315) 777-8377. 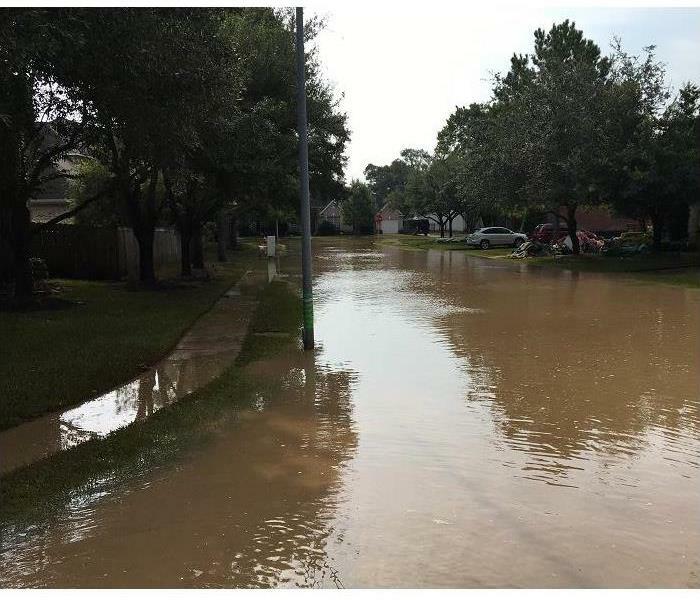 Regardless of the season or time of year, Watertown residents understand that flooding is a distinct possibility that they should remain mindful to avoid. While you cannot change the weather patterns or their severity, there are steps and precautionary measures that can get taken to reduce the impact of these disasters on the property. Also, you can put a plan in place to contact professional disaster recovery technicians like ours whenever these emergencies occur that threaten your home. Securing professional assistance for flood removal and other restoration for your Watertown home is vital in the earliest stages of exposure for your property. While you cannot prevent the occurrence entirely, our SERVPRO team can help by offering real-time mitigation solutions that can protect the things that matter the most to you. For this reason, the contents department of our team can earmark items for safe removal from your home to protect them from further damage. Flood removal often refers to the extraction of flood water, and this is something that you should not attempt to do on your own. 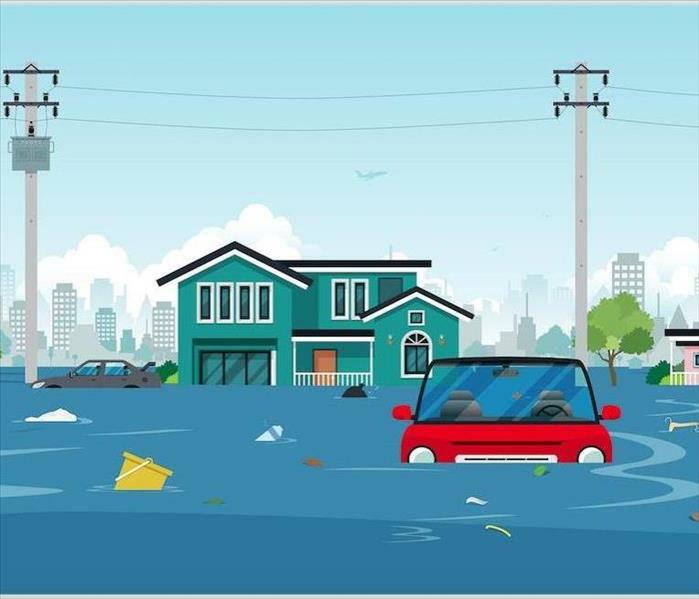 As a Category 3 loss incident, floodwaters can contain bacteria, chemicals, sewage, and other contaminants that can be hazardous to your health when exposed. Our professionals have gotten extensively trained in the use of personal protective equipment and have the tools to quickly extract this water from your home using truck-mounted pumps, gas-powered pumps, and extraction wands. Debris removal and demolition is often another phase of this initial restoration, as it can help to provide a safe and clean environment for our technicians and anyone else that might enter the home once the work has begun. The efficient approach of our SERVPRO team is deliberate to ensure that you do not stay displaced from your home any longer than is necessary to restore the damage the flood has caused. Recovering from a flood in your home is something that homeowners do not have the resources to do on their own. Our SERVPRO of Jefferson County rapid response team is standing by 24/7 to help amid the emergencies that could threaten your property. Give us a call at (315) 777-8377. It is common to experience bad odors in your property after a fire incident. It is common to experience bad odors in your property after a fire incident. The type or strength of the odor depends on the kind of materials consumed by the fire. 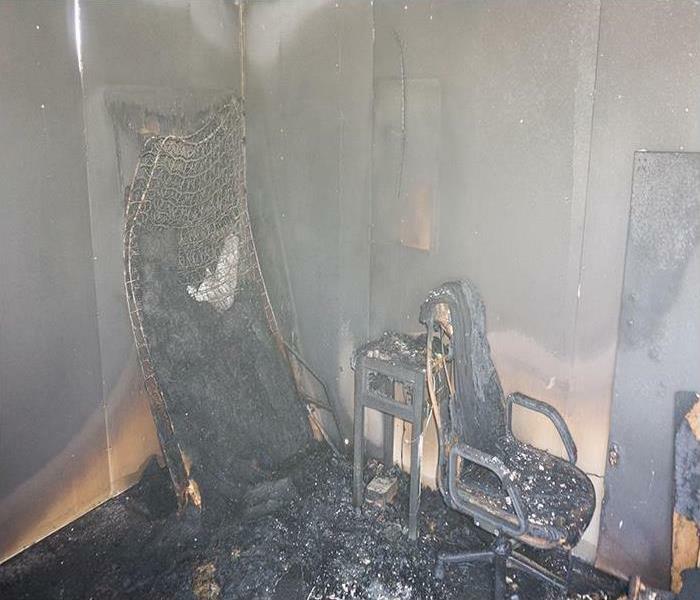 Fires involving synthetic materials like plastics or natural ones such as proteins leave a bad stench all over the property, even in sections unaffected by the flames. We offer professional cleanup and deodorization services to restore your Watertown property to its preloss state. Our IICRC certified FSRT, Fire and Smoke Restoration Technicians, utilize different techniques to achieve this. The process of fire damage odor removal in Watertown involves different steps. Identifying the source of the odor is crucial before taking other steps because as long as the source is present, any other deodorization measure is not likely to work. Burnt residues produce most of the odor. Our SERVPRO technicians remove all unsalvageable materials from the house and clean salvageable ones eliminating most of the odor sources. The smoke residues deposited in different parts of the house can prolong the presence of bad odor in the house after the blaze. Because heat opens up pores in materials and some of the particles of smoke residue are tiny, they reach deep into materials. The selected method of cleaning or deodorization must reach these residues to be effective. Our SERVPRO technicians are skilled in different deodorization procedures including fogging which allows the deodorizer in vapor form so that it can penetrate the material just like the smoke residues causing the odor. Sometimes, the agents causing the odor might not be visible. This outcome is common in grease or protein fire. In such cases, cleaning the entire property helps remove all residues left on surfaces. Our SERVPRO technicians focus attention close to the source of the fire first. In case of a grease fire, we do a thorough cleaning to the stove, vent hood, countertops, vent filter, cabinets, walls and ceilings in the kitchen. After finishing with the areas close to the source, we proceed to the rest of the house. With help from SERVPRO of Jefferson County, it is easy to eliminate bad odors. You can reach us at (315) 777-8377 any time. We’re Faster to Any Size Disaster. Whenever your Fort Drum home suffers a fire, you want to get the situation resolved as quickly as possible. Unfortunately, there are hoops that you must jump through to obtain the approval of the home insurance claims that you might file in a situation like this. However, there are easier ways to obtain the necessary documentation and evidence that your adjuster requires to process the claim to get restoration and cleanup started on your property quickly. From the moment that the first responders have left your Fort Drum property, you get your first look at the fire damage from a distance. While your first instinct might be to contact your insurance company directly, it might be more beneficial for you to reach out to our SERVPRO team before that. NO, IT IS NOT! Get your insurance adjuster on the scene with a phone call. We can arrive quickly after you call with the tools and personnel to perform a thorough assessment of the damage to your home and catalog these damages for use in determining an estimated cost for restoration. Our SERVPRO estimator can take photographs of damaged areas of your home to collect with the documentation to show evidence of the extent of the fire effects throughout your house. As you have already contacted our restoration team to begin this vital assessment of the property, we can begin mitigation work at this time to protect your home and its contents from further damage before the full restoration costs get approved by your insurance provider. The caveat here is if you sign off on the work order. We often communicate and coordinate with your adjuster prior to beginning the cleanup and restoration. 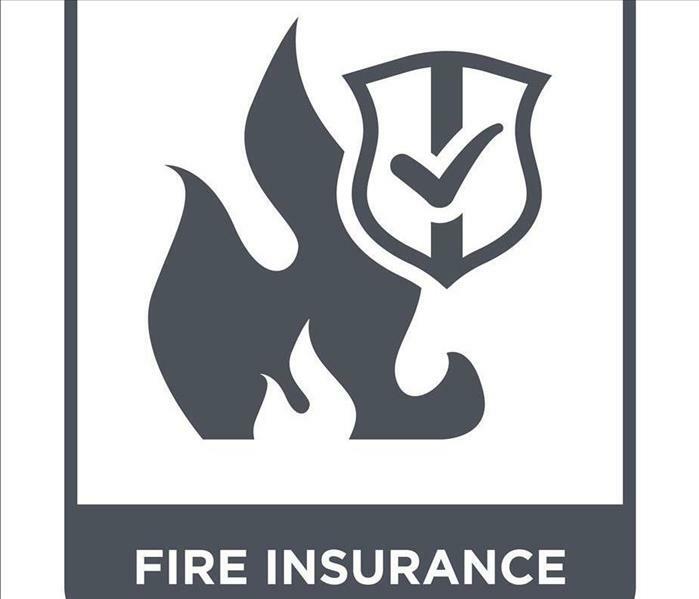 We work closely with the major and local insurance companies servicing our area to provide our customers with a seamless transition between our mitigation steps and the full restoration of their fire-damaged properties. While you might not expect a disaster like fire to affect your home, you can help to ensure that the restoration process happens quickly by calling our SERVPRO of Jefferson County rapid response team right away. You can reach us 24/7 by calling (315) 777-8377.